Aaron Gordon #00 of the Orlando Magic handles the ball against the Memphis Grizzlies on March 10, 2019 at FedExForum in Memphis, Tennessee. ORLANDO – Coming off their fourth straight home victory, the Grizzlies (29-42) will try to end a three-game road losing streak Friday when they face the Magic (34-38) at the Arena Center. The Grizzlies will try to secure their first season sweep of any opponent this season with a win Friday against the Magic. Memphis won the first matchup in the two-game series, with Mike Conley and Avery Bradley combining for 47 points to lead six Grizzlies players in double figures on the way to a 105-97 victory on March 10 at FedExForum. The Grizzlies, however, have struggled out of conference this season, going 20-23 against the West but 9-19 against the East. The Magic are 1.5 games behind Miami for the eighth and final playoff spot in the East, and have won five in a row at Amway Center. Conley is being listed as doubtful with general soreness for Friday’s game, but enters the weekend back-to-back set just 30 points shy of passing former teammate Marc Gasol to reclaim the Grizzlies career scoring lead. Conley held the scoring lead entering last season, but missed 70 games to season-ending heel surgery and was passed by Gasol (11,684 points). A 12-year veteran, Conley already leads the franchise in games played, assists, steals and three-pointers made. Should he retake the scoring lead, he would become one of three players to currently lead an NBA franchise in those five categories, joining LeBron James (Cleveland) and Reggie Miller (Indiana). Grizzlies center Jonas Valanciunas is coming off the highest-scoring game of his career after finishing with 33 points and 15 rebounds (nine offensive boards) in Wednesday’s overtime victory against Houston. It marked the third career of at least 30 points and 10 rebounds for Valanciunas, who became the third player the Grizzlies acquired at the Feb. 7 trade deadline to post a career-high scoring effort after joining the team. Bradley (33) and Delon Wright (25) also had their top scoring games with Memphis. 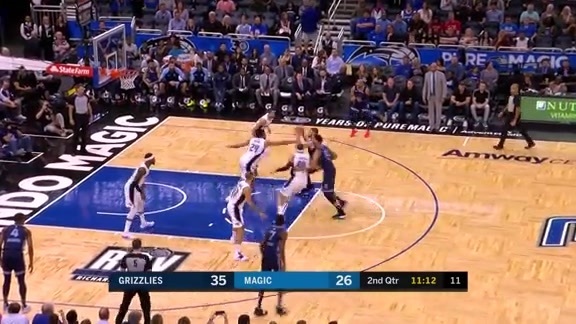 The Grizzlies-Magic matchup features a showdown of two of the league’s best defensive teams this season. Memphis is second in the league in scoring defense at 104.9 points per game, and Orlando is fourth at 106.1. Both teams are also in the top eight in opponent field goal percentage and games holding opponents below 100 points, with the Magic posting a 17-3 mark when keeping teams below the century mark on the scoreboard. Memphis is 4-1 in the last five games it held opponents under 100. The Grizzlies are listing Kyle Anderson (shoulder), Dillon Brooks (toe surgery), Jaren Jackson Jr. (thigh bruise), Bradley (shin) and C.J. Miles (foot) as out, with Joakim Noah (knee) questionable and Conley (general soreness) doubtful for Friday’s game. The Magic are listing Mo Bamba (leg), Isaiah Briscoe (knee), Markelle Fultz (shoulder) and Timofey Mozgov (knee) as out against the Grizzlies.